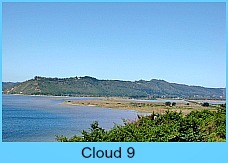 Choose a day when the air is clear and the sun is shining to do the mountain passes circular day-drive that will take you through the Montagu Pass outside of George returning over the spectacular Outeniqua Pass. A lazy Sunday 11:00am start would be about right. 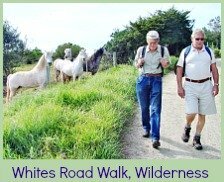 As you drive through Wilderness and up Kaaimans Pass, its worth stopping at Dolphin Point to have a look back at Wilderness beach, perhaps scan the ocean for whales and dolphins and have a look at the old railway bridge that crosses the Kaaiman’s river. 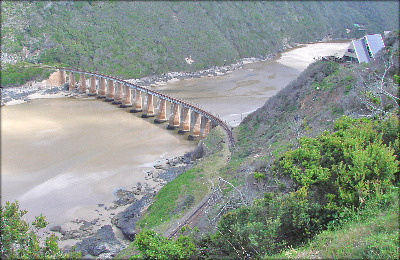 The floods of 2006 irreparably damaged the historical Outeniqua Tchoo choo’s line and the house below you to the right nearly slid over the cliff into the sea. It has been considered unsafe for occupation ever since and a once beautiful house with an unbelievable view has sadly gone to rack and ruin. 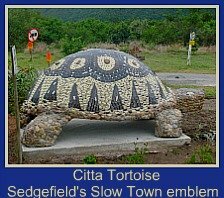 Back in the car, travel through George keeping to the right even once you have gone around the circles in the centre of town and head for the sign that says Outeniqua Pass and Oudtshoorn. 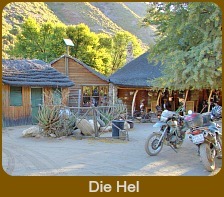 In the lower foothills of the pass turn right at the sign for Montagu Pass. 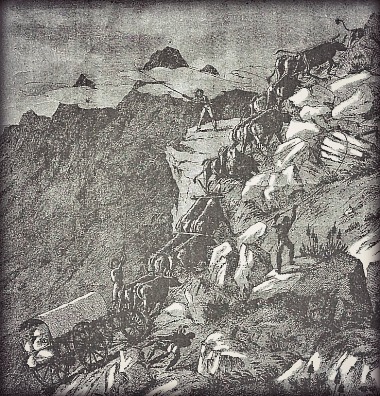 It was a death defying ordeal to cross the "Outeniekwaberge", possible, but barely, before the Montagu Pass was built. 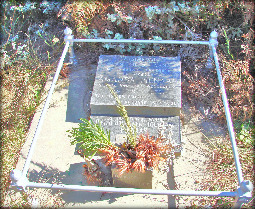 Colonel Charles Mitchell, a distinguished soldier and also a competent architect and surveyor, was commissioned by John Montagu, the Colonial Cape Secretary, to survey a better route through the mountains. It was not engineered by Thomas Bains however as so many of the passes in this area were, but in this instance, by Henry Fancourt White, an experienced engineer who was brought from Australia to tackle the task which cost R71000-00 a mere sum today but a lot of money back then. 50 convicts laoboured strenuously with the harsh environment and the work begun in 1844 was completed in 1847. John Montagu officially opened the pass that was to be named after him in January 1848. Journeys that used to take 3 days were shortened to 3 hours by the opening of this pass. This old gravel road is still operational today and has deservedly been declared a national monument. It is narrow and winding, edged in many places with very well done, dry walling. The remains of the old tollhouse still exists where users had to pay a penny per wheel and a penny per ox, to use the road. 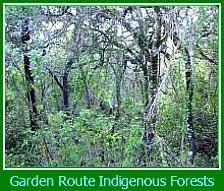 You will notice signposts along the way marking historic spots. You can imagine that the road still appeared narrow and difficult for a driver of a wagon with its span of oxen that had to carefully manoeuvre the bends. Whistling and shouting and cracking his whip, he had to make an oncoming traveller aware of his position on the road. 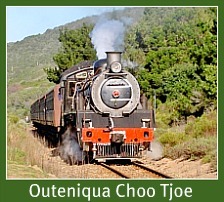 There will be many opportunities on this mountain passes trip for you to stop and take pictures of the road, the stone bridge, the railway line, the streams, the fynbos and the Outeniqua Mountains. You can stop at Amanda’s grave. Amanda loved the area so much she asked her husband to have her buried there. He now lies there with her too. 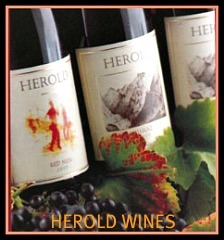 At the top of Montagu Pass is the tiny village of Herold that has a few houses, a church, a countrified B&B and Herold Wines, a farm in the shadow of the mighty Cradock Peak and certainly worth a visit if you have the time. 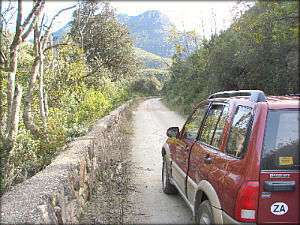 A few kilometers further on you reach the tarred road that links Uniondale to George via the Outeniqua Pass. This pass, instead of taking you through the mountains will take you over the mountains with at least 3 magnificent viewpoints where one can see over George all the way to the Indian Ocean. That is why to get the best out of the mountain passes day-drive one should choose a clear day for it. However, as you head up the mountain you will come across a roadside shop, Hops Valley Farm Stall on your left-hand side that will make an excellent lunchtime stop for a tasty pizza and delicious deserts. The shop also sells yummy homemade jams, olives, condiments, dried fruit and wine all of which is very reasonably priced. I always stock up when I go there! Refreshed and satiated you will now be ready to enjoy the rest of your mountain passes journey. 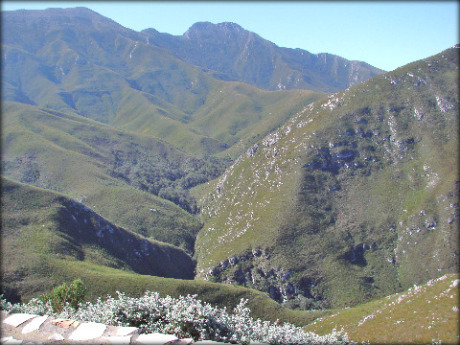 Initially completed just after the Second World War, built by the labours of Italian prisoners of war, the Outeniqua Mountain Pass has been upgraded twice since then. 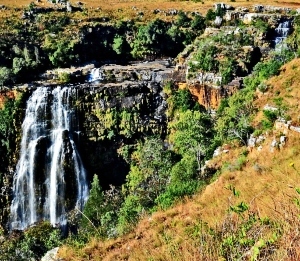 The last time it was engineered by one of the great road builders of South Africa, P.A. De Villiers. It is a spectacular mountain pass and a great engineering feat. The highest point of 799m is reached 14kms from George. From the various lookout points one can see the Montagu Pass and the railway line to Oudtshoorn that is also a railway line of repute, being the highest in the southern hemisphere. 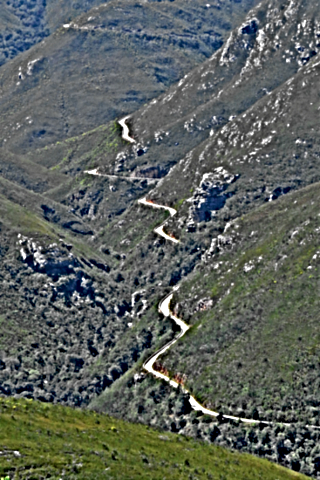 For most of its route through the mountains it looks down on the Montagu Pass road! 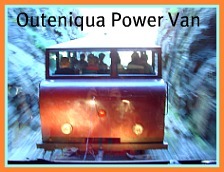 To appreciate this, you can consider doing the 3hr Outeniqua Power Van train ride. The two highest mountain Peaks in the range of the Outeniqua Mountains, aptly named George Peak –1336m and Cradock Peak - 1578m can be seen and as always wonderful fynbos unique to the mountains. It’s worth taking a reference book and of course, your camera, with you. 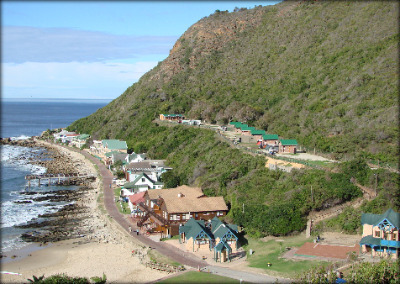 As you leave the mountain passes behind and drive through George again you will be aware that it is the Garden Route's bustling city. All the big chain stores are represented here and it has a vital industrial and manufacturing sector that employs a substantial workforce and supplies all the region's towns. It is our main source of "retail therapy"! 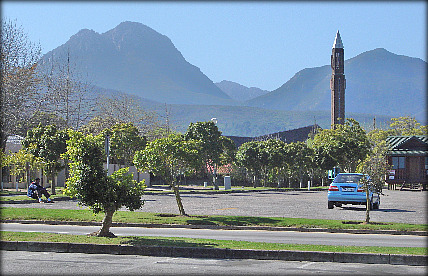 With the Outeniqua Mountains as its backdrop George is for me, one of the prettiest cities in South Africa. 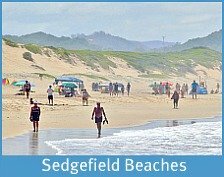 Driving out of George back towards Sedgefield, before you descend Kaaimans Pass, you may like to turn right at the signpost to Victoria Bay. There are parking bays at the bottom of the hill. This is a protected bay with grassy picnic spots above the beach and is altogether charming. 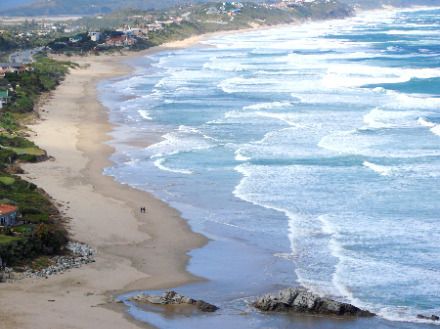 Furthermore, it is a safe place to swim and body surf and is a favourite regular haunt for surfers. There is a beach café, changing rooms and ablution block with showers so one can change into a bathing suit and shower after a swim. There are numerous houses acting as B&B’s along one side of the bay and a pier that one can fish from. 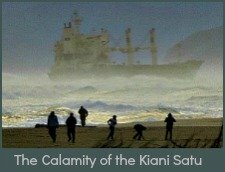 One can walk the whole length of the bay right to where the breakers crash on the rocks. 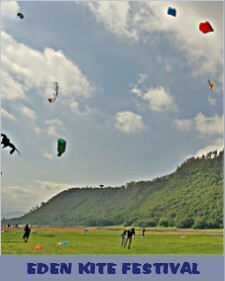 Above the beach are camping and caravan amenities that make the bay a busy place in the holiday season. From the campsite on the left-hand side, one can follow a path to the disused railway line and go through some tunnels to get an overview of the area. Between June to early January you could catch sight of the Southern Right or Humpback Whales or even a pod of dolphins or Killer Whales. It's time to have a sundowner out on your patio watching the sun set over Swartvlei lagoon. 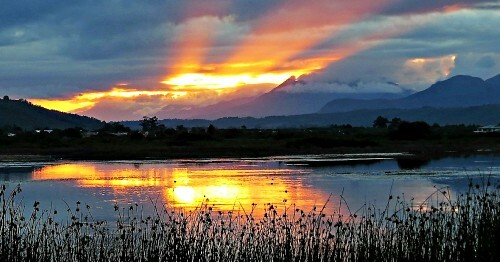 The sky reflects every spectacular shade of orange until the sun lets it go to dip behind the Outeniqua Mountains. 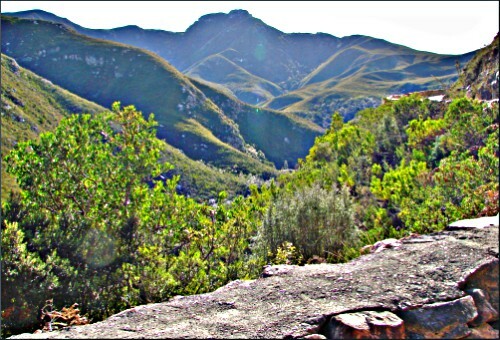 Mountain Passes South Africa - We are as passionate about maps as we are about mountain passes. A good map is a thing of beauty that can transport you into the mists of time or get your sense of adventure churning. It is a place to make discoveries about deserts and seas, mountains and lakes; of roads leading into places you have not been before. 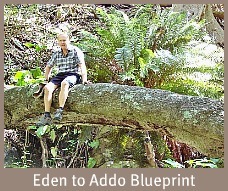 A place to pore over holiday destinations or weekend camping trips. A map is your window to the world.